Photographer, Lindfield. Marchant set up in business as a photographer at 6 Luxford Road in Lindfield by about 1912, perhaps immediately afte his marriage. He remained at this address for twelve years or more, but by 1927 he moved to The Studio, Sunte Avenue in Lindfield. He was still at Sunte Avenue in 1938. In their book, Lindfield remembered (2002, S.B. Publications, Seaford), Peter Duncan, Gwyn Mansfield and Brian Tester reproduce one of Marchant's decorative trade cards, which provides examples of his work, ranging from studio portraiture to animal photography and recording local events and landscapes. He seems to have published postcards in quite small print runs, and many of his more interesting real photographics are now difficult to find. Some of his earliest show the Army airship Gamma visiting Lindfield Common on April 22, 1912. The cards are sepia toned, with narrow white borders, and lack captions. They are embossed with Marchant's name. He produced other sepia toned cards with borders, but also many without borders. No obvious chronology is apparent - he was still producing cards with borders in 1922, but some borderless cards appeared by 1914. Although he embossed some cards, others are anonymous, or have photographs labelled "W. Marchant, Lindfield" or "W. Marchant, Photo, Lindfield" in a joined-up script with elegant loops. Remarkably few cards have captions. Most of Marchant's cards record social occasions, such as pageants, gymkhanas, flower shows and the annual Lindfield fair. Musicians and other entertainers are shown on stage in the village hall. An exceptionally fine card shows the local fire brigade posing beside their horse drawn engine, while another shows them in action, damping down a blaze. The Lindfield band, choirs and a visiting Motor Mission from Newick also caught Marchant's attention. 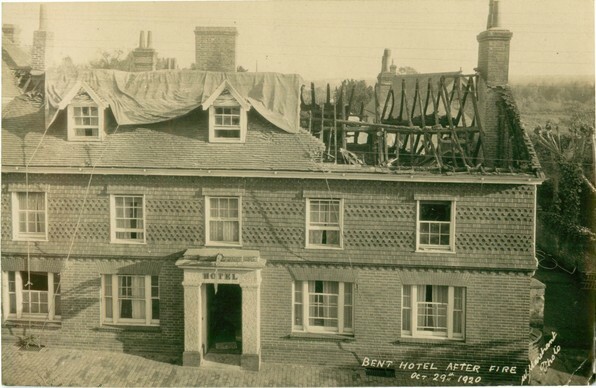 A series of cards show troops on parade in 1914 and 1915; others record the Bent Hotel after the fire in October 1920 and the unveiling of the War Memorial on November 12, 1922. General view cards are scarce, but include some of Old Place, the High Street and the Pond. The Lindfield Steam Laundry evidently commissioned Marchant to make a photographic record of their business. There are at least 5 cards showing the interior of the Laundry, and a card showing their horse and cart posing beside their motor van. Marchant continued to issue cards during the 1930s. One of his more curious cards shows a pram-like decorated cart (the "Three Bonny Babies") that won first prize at a show in Haywards Heath on March 12, 1930. At least two cards date from May 1935 and record the Lindfield celebrations for the Silver Jubilee of King George V. A black and white real photographic card of Clayton tunnel entrance with a 1937 postmark has "W. Marchant Lindfield" written diagonally across the bottom right corner of the photo, but nearer the middle is labelled "C Clarke Ltd." Perhaps Marchant took the photograph and Charles Clarke published the card. He is known to have supplied photographs to Clarke's newspaper, the Mid Sussex Times. In 1938 Marchant contributed photographs of local views to the Official Guide to Haywards Heath, Cuckfield and Lindfield, which was published by the local Chamber of Commerce and printed by Charles Clarke. William Marchant was born at his parents' home, 2 Somerset Cottages on Lindfield Common on August 21, 1886. His father, John Henry Marchant, had been born in the village in 1853, and worked as a brewer's drayman. His mother, Elizabeth Marchant, formerly Isted, had been born in 1851 or 1852 in the Worth and Crawley area. In 1891 and 1901 the Marchant family were still living at 2 Somerset Cottages. Besides William, there were 5 other children: Ada Louisa Marchant, born in 1876; Harry Marchant, born in 1879; Mabel Alice Marchant, born in 1882; Kate Marchant, born in 1884; and John Henry Marchant, born late in 1888 or the first quarter of 1889. On August 28, 1912, William Marchant, who was 26 years old, married Myra Ellen Katie Hookway at Lindfield Parish Church. Myra was 32 and the daughter of Arthur Frederick Hookway of Lindfield, who was an organist, quite possibly at the Parish Church. William Marchant described himself as a printer, and his father as a groundsman for the "L. B. Club", perhaps Lindfield Bowling Club. Teetotal societies were attracting a considerable following at the time and perhaps William was keen to downplay his father's role in the beer trade.